Immuli 24 is a potent nutrient for human cell nourishment made from 24 types of High Grade Beta Glucan. Immuli 24 Beta Glucan is a biological response modifiers (BRM), also a natural polysaccharide of glucose monomer linked by third and sixth carbon atom (1,3 / 1,6-glucan). Research on Beta Glucan has past the 20th years mark by various researchers and scientist with extremely good results. Immuli 24 range of Beta Glucan are organically grown in Japan and are categorized as high activation medicinal mushrooms. 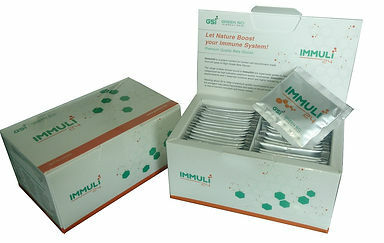 Immuli 24 contains 173 phytonutrients and 7 essential nutrients which are highly needed by cells of human body. Immuli 24 are produced by using the Japanese state-of-the-art extraction method and are free of harmful microbes and heavy metals. 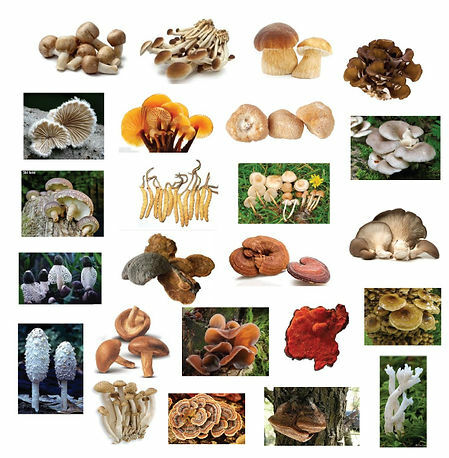 With stringent manufacturing process and special extraction method, it takes about 30kg -35kg of medicinal mushrooms to produce 1kg of Immuli 24 Beta Glucan. Users of Immuli24 Beta Glucan can expect to experience enhancement in their immune system up to 4000 times within 3 days of consumption. Amino acids are the basic unit of proteins which given a specific structural molecule form to it and also making it to contain biochemical activity. Protein is an important active molecules of human body, including catalysis enzyme. Out of 18 types of amino acids, these are 8 types of amino acids known as essential amino acids which human body can't synthesize or synthesized too slow, must be supplemented through diet, they are leucine, isoleucine, valine, methionine , phenylalanine, tryptophan, threonine and lysine. Histidine is needed during children growth and development period, arginine, cysteine and tyrosine is required for premature children. The other 6 types of non-essential amino acids (alanine, aspartic acid, glutamic acid, glycine, proline, serine) can be produced with glucose or other mineral. Vitamin is an organic chemical compound, a vital nutrient that an organism requires in limited amounts which the organism cannot synthesize the compound in sufficient quantities and it must be obtained through the diet. Vitamins are not like carbohydrates, proteins and fats which can be produced and cells composing, but they play an important role in regulating the metabolism of the organisms. Lack of vitamin can cause serious health problems; adequate intake of vitamin can keep the body strong and healthy. The 13 types of vitamins are A, B1, B2, B3, B5, B6, B7, B9, B12, C, D2, E and K1. Minerals are the main element of human tissue composing, maintaining normal physiological function, biochemical metabolism and other vital activities. Its unable to produced or synthesized and must be supplemented through diet. Out of 74 types of minerals, there are 21 types which is essential minerals for human body. Calcium, magnesium, potassium, sodium, phosphorus, sulfur, chloride are the 7 types of macro minerals which are required in fairly large amounts. Iron, copper, iodine, zinc, selenium, manganese, molybdenum, cobalt, chromium, tin, vanadium, silicon, nickel and fluoride, a total of 14 types of trace minerals which only needed in much smaller quantities. The other minerals are aluminum, antimony, arsenic, barium, beryllium, bismuth, boron, bromine, cadmium, carbon, cerium, cesium, dysprosium, erbium, europium, gadolinium, gallium, germanium, gold, hafnium, holmium, indium, iridium, lanthanum, lead, lithium, lutetium, mercury, neodymium, niobium, osmium, palladium, platinum, praseodymium, rhenium, rhodium, rubidium, ruthenium, samarium, scandium, silver, strontium, tantalum, tellurium, terbium, thallium, thorium, thulium, titanium, tungsten, ytterbium, yttrium, zirconium. Vegegreens is the most primitive, basic, healthy food and also suitable for all ages which made up of natural food ingredients. They are 9 types of herbal : alfalfa, ashwagandha, black cumin, chamomile, cinnamon, dandelion, ginger, parsley, eleuthero, 4 types of fruits and vegetables : broccoli, carrot, rose hips, spinach and 2 types of algae : spirulina, chlorella. Crypthecodinium cohnii is a species of dinoflagellate microalga, its used industrially in the production of docosahexaenoic acid. Docosahexaenoic acid (DHA) is an omega-3 fatty acid that is needed by human body and it can be synthesized from alpha-linolenic acid. Docosahexaenoic acid is a major element of the cell growth and maintenance in the nervous system, also a primary structural component of the human brain and retina, docosahexaenoic acid comprises 20% of the polyunsaturated fatty acids (PUFAs) in the brain and 50% of the PUFAs in the retina, therefore, is very important in the fetal and baby mental and visual development. Docosahexaenoic acid also used in the treatment of cancer, inhibition of inflammation, reducing blood lipids, preventing cardiovascular disease, improving alzheimer, inhibition of influenza virus replication and prolonging pregnancy to prevent preterm birth, promoting the absorption of phosphatidylserine, anti-aging, skin moisturization and others. Alpha-linolenic acid is an omega-3 fatty acid, its one of two essential fatty acids (EFAs), so called because they are necessary for health and also is a basic substances of cell membranes and enzyme. The increasing of omega-3 polyunsaturated fatty acids in cell membrane will strengthened membrane fluidity and plasticity. Fluidity of membrane and glucose transporter are related, will increasing the regulation of glucose metabolism and sensitivity to insulin, able to help improving glucose tolerance and reducing insulin resistance; increasing of saturation fatty acids in the cell membrane can lead to decreasing of metabolic rate, will also cause fatigue and obesity. Plasticity of the cell membrane has an important role in the against arteriosclerosis and restoring blood vessel elasticity.